I usually try to keep interviews on the phone to 30-45 minutes. Some stars (like Rufus, for example) are so backed up with media that you're grateful to get 15 minutes, while lots of people who planned to give me 20 minutes end up spending forty, if we're having a good conversation. But once I started talking with my friend John Kruth, we didn't get off the phone for an hour and 20 minutes. He's incredibly entertaining and informative--a lot of stories, some even fit to print. The man is a boundless repository of ideas and feelings, of history. He is a virtuoso mandolinist, and probably plays a handful of other instruments well. He writes strange and wonderful songs and has made quite a few records, solo and otherwise. He is a beatnik and a poet and a professor. He is also a superb biographer, as his recent triumphant volume on the enigmatic and revered Townes Van Zandt, To Live’s To Fly, reveals. (His maiden biographical voyage concerned Rahsaan Roland Kirk, called Bright Moments.) To write about Townes, and indeed, just to research the prayer-rugged subject, proved a delicate and difficult task, particularly because so many held Townes in protective esteem. Many of the travails and the travels are included between the covers of the volume that it took over 5 years to complete. 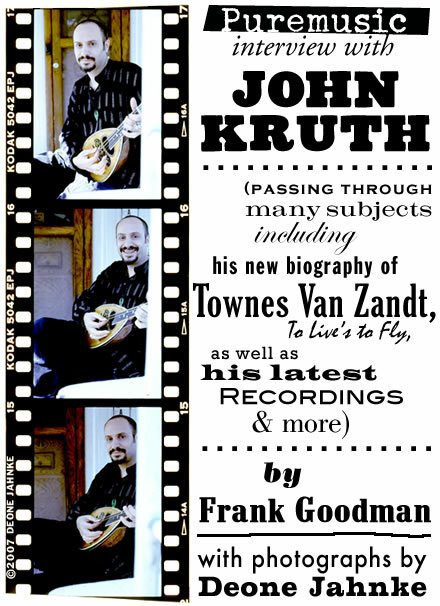 We take you now to Greenwich Village, to speak with a man for many cultures, musical styles, and far flung subjects of investigation and biography, John Kruth.